Teethmarks is a cross between a projected poem and randomly associative, private television. Fiction writer and poet Darryl Whetter rearranges the text of his short-story collection A Sharp Tooth in the Fur (a 2003 Globe and Mail top 100 book). 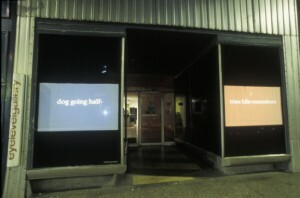 The text of each story has been distilled down to three-word phrases, sometimes using random composition techniques, to create a projected loop of tinted phrases which plumb subjectivity by testing minimalist coherence. At a time when email addresses, hashtags and URLs provide found poetry, Teethmarks lives in the already verbal landscape of commercial walking spaces and wonders how phrases get their teeth into us. Although random composition can be exciting in theory, Teethmarks avoids the sterility of purely random composition in several ways, ultimately with the goal of presenting minimal traces of subjectivity or kernels of memory. The video loop of 160 slides is not punctuated by any title screens. The story “Non-Violent, Not OK” rates the dangerousness of areas of an urban protest with a green, yellow and red stoplight metaphor. In preparation, protestors interrogate themselves and other protest movements by wondering when and how they are “okay” or “not okay” with violence (before being attacked by police). Here in Teethmarks, the viewer meets the minimalist phrase “yellow ok billyclub” in a rhizomatic text free from any insistence on any starting or stopping points. 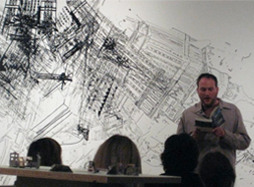 The artist has also released a book of poetry and is familiar with short-line composition, rapid juxtaposition, appeals to the ear, etc. of poetry. Teethmarks can also be regarded as projected (tinted) poem. Installation shot: eyelevel gallery, Halifax, NS. 28 Sept. — 11 Oct., 2003.